The Sessions' thought the 5-bedroom house on nearly two acres would be their dream home. Little did they know, the home’s current reptilian residents had other plans. They slithered behind the walls at night and released foul-smelling musk into the drinking water. And they were so numerous that Ben Sessions once killed 42 in a single day. 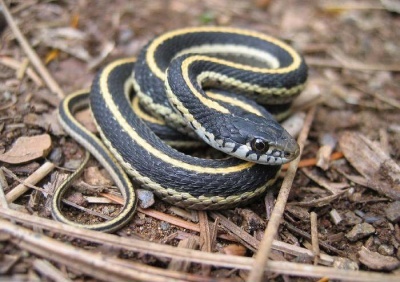 Shortly after buying their dream home, Sessions and his wife discovered it was infested with thousands of garter snakes. For the next three months, their growing family lived as if in a horror movie. More than a year after they abandoned the property, the home briefly went back on the market, and they fear it could someday attract another unsuspecting buyer. That's when they realized their home was probably sitting atop a hibernaculum, a place where snakes gather in large numbers to hibernate over the fall and winter. There had been warning. When they bought the house, a document the couple signed had noted a snake infestation. That unscrupulous real estate agent assured the Sessions' that the snakes were just a story the previous owners invented to abandon their mortgage. It turned out practically everyone in the tiny town of Rexburg, Idaho, knew the snakes were there. The property even had a nickname among the locals: The Snake House. The Sessions left in December 2009, the day after their daughter was born and just three months after moving in. Because of the paperwork they had signed, the couple had little recourse but to flee. They filed for bankruptcy and the bank foreclosed. The owners of luxury condominium Eagles Point at the St. Croix, in Prescott, Wis., wanted to show their support for Minnesota troops. So they decided to donate a beautiful condo to one lucky veteran. A year later, they still have no takers. They've tried to find a veterans' organization or other group to help them choose a veteran and arrange logistics. They've contacted more than a dozen organizations - from First Lady Mary Pawlenty's "Military Family Care Initiative" to the Minnesota Military Appreciation Fund to the national Troops First Foundation. They even tried the Minnesota Lottery. No one has come forward to help. Miyamoto and project owner Tom Meehan were watching news of the war in Iraq when they thought of the idea. They wanted to support the troops. They had hoped not only to help out a veteran, but to set an example to other developers to launch a bigger trend. One of the primary concerns from the military and veterans groups is the possibility for hidden costs, either to the organization or the lucky recipient of the condo. Meehan and Miyamoto admit they're not familiar with the tax ramifications, either. All they know is there is a great place in the 43-unit complex waiting to fill a veteran's needs. The floors, walls, cabinets and woodwork would be custom finished. Several Twin Cities trades groups have agreed to donate their time to make that happen. Meehan and Miyamoto are hoping that more organizations will step in to help out as well. There is a 2,000-square-foot, three-bedroom rambler for sale in Chaska. Ron Olson is even willing to deliver it to a lot of your choice, as long as it's close to Chaska. Ron is a contractor who runs an excavation company, acquired with the custom-built house after he was hired last fall to demolish it on a lot in Chaska MN. The home had suffered some smoke damage after some paint rags caught fire during the finishing process. The buyers didn't want it though, so the builder offered to tear it down and build a new one. Rather than haul it to a landfill, Ron decided to recycle the house, which would have sold for $600,000 at its former location. "It's really a waste to take a perfectly good house that can be cleaned up fairly easily and throw it away like it's garbage," he said. "Ethically, I don't think we should be doing that." The house is currently sitting on a trailer on Bavaria Road, waiting for a home... Uh... to be moved. Many people were upset with their home's assessed values last year. Even Minneapolis' tax assessor wasn't satisfied with his property tax statement. Minneapolis City Assessor Patrick J. Todd maintains his northeast Minneapolis home was valued at far more than it was worth when he bought it. He appealing to the Minnesota Tax Court to contest the value of his home, which was set by the office he heads. You read that right. "It's one of those properties where the owner never called [the assessor's office] to say the value was too high," he said. That's an understatement. He bought the 2-bedroom, 1-bathroom home as investment property in July 2008 for $90,000. On January 1, 2008, the home had been assessed at $166,500 with a tax bill for payable 2009 of $2,239. The reason behind the discrepancy is easy enough to explain. City assessors don't usually set foot on every property every year. Assessment is done through Computer-Assisted Mass Appraisal, which bases values on neighborhood and sales. The 61-year-old rambler was built of concrete block and still had the original furnace, plumbing and electrical components. The 804-square-foot house had a single detached garage, no basement and no central air conditioning. This simple house with no real updates didn't fit the property model on which assessments are based. The home owner, having lived in the house since 1951, failed to alert the city that it was valued higher than it should have been. Because of the sheer size of Minneapolis, it would be impossible to do a property by property assessment. "We're trying to do the best job we can," Todd said. "If you don't agree with us, you've got to call us." To read more about the case, check out the Star Tribune Article. When the Schrank family decided to sell their Prior Lake home and property, they were horrified to find that the new buyer wanted to destroy the house and build a new one in its place. The Schrank's are now donating the home to Twin Cities Habitat for Humanity. The 30-Ton house, 64-feet in length, 32-feet in width took up both lanes of traffic, which created quite the chore Wednesday. Crews had to cut branches from the tree-lined streets, Xcel Energy took down low power lines and some street signs were taken apart. It took 4 hours to move the house 1.5 miles. "It's always exciting to get a house donation, especially as rare as a donation that involves a house move," Sharon Rolenc said, from Twin Cities Habitat for Humanity. "It will go to a family in very high need of affordable housing." Habitat for Humanity say they have fulfilled less than 1% of house-moving requests. The Schrank's house met their standards because it is energy-efficient and the move was close in proximity. Because the house was donated, the new homeowners will get a discount as well. A family will be selected in the Spring. For people who are considering a tear down to build a new home, it may be worth consideration to call the local Habitat for Humanity and find out if it is possible to give the house to a new family. When most people decide to sell their home, they take some time to spruce up the place for when potential buyers visit. They clear out the clutter, dust, sweep out the dirt, vacuum, and generally make it more inviting. It makes the home much more likely to sell. A house in Louisianna just might not ever be sold because of the sellers failure to clean out some of the skeletons in their closet. Or in this case, the basement. James Kenny, a forensic investigator with the Terrebonne Parish Coroner's Office, says the bones found Saturday were so old that dirt had saturated the marrow inside them. He says they probably are remains of Native Americans buried long before the house was built. Kenny says he learned that the previous residents would often find bones while mowing the lawn or doing yard work, and would put them in the basement. Half of the split-level house is on top of a circular mound, which parish officials suggest may be an Indian burial mound. “Those bones have been out there since the 1800s,” said Gary Alford, senior investigator at the coroner’s office. Even so, nearly everyone has at least heard of the Poltergeist movies. Some brave soul may want to buy this home, but it may take a while! It's been an especially long time since there was a Strange But True post. And admittedly, this one is a little weak, but it's still worth mentioning because it could have ended up a much bigger deal than it is. The city of Minneapolis tried to force Basim Sabri to construct his proposed 77-unit condo development along the Midtown Greenway between Grand and Pleasant Avenues with an all-brick exterior. Furious at what to him seemed an arbitrary attempt to hold him to a different standard than other developers, Sabri mailed each city council member three bricks to "bolster is argument that an all-brick exterior was impractical." Then he sued. The result is that he will still use brick in the development, but he is also permitted to use other materials in specified areas, mainly stucco. The condos will be built utilizing the brick shell of the former Midwest Machinery building and two new stories. What caused the flap in the first place? Why was the City trying to dictate the exterior of the building in what seemed like an unfair way? Improperly filled out paperwork. The trouble started when it came to this new section. Sabri wanted to use stucco as an outer shell for those two stories, while the City of Minneapolis wanted to insist that it be made of brick. It was discovered that contradictory conditions had been placed on the project in two different parts of the approval process. In granting a conditional use permit, the City Council said that the new areas could be stucco. But three months later, in actually approving the site plan, the council required that the addition be brick.